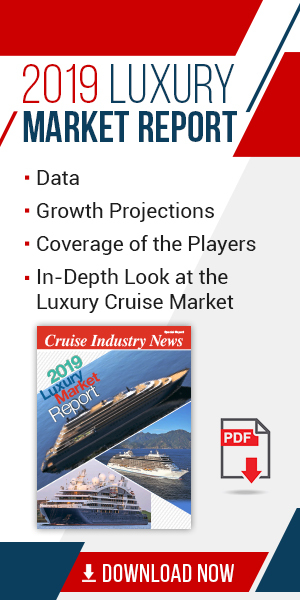 Three new ships on the orderbook at Disney Cruise Line will dramatically grow the line’s projected market capacity by 2024, according to the 2018-2019 Cruise Industry News Annual Report. A trio of LNG-fueled ships will join Disney’s fleet, with deliveries in 2021, 2022 and 2023, respectively. The 2,500-guest ships will complete the brand’s fleet lineup at seven ships, joining the Magic, Wonder, Dream and Fantasy. While Cruise Industry News ranks Disney as the 11th biggest brand by projected guest capacity in 2018, it is poised to move up by 2024, with capacity expected to increase to over 1 million guests on an annual basis.